Singing and Spinning: "I'm 3 in January"
This year, Ivy turned 3 on the 3rd. Emily said that that is her "golden birthday." I had never heard of a golden birthday, but I think it's really a fun thing to focus on to make that one time in a lifetime special. For Ivy's birthday, we had Scott's family and my family over for Sloppy Joe's and cake. 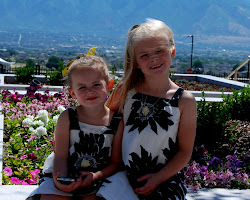 We had to do it fairly early in the day because Jade had a gymnastics performance in the evening. 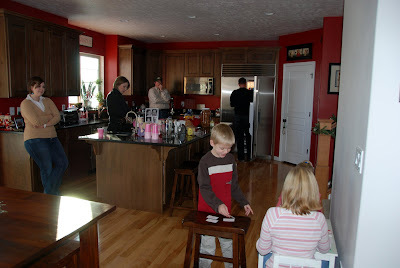 The kids always play really well together and it's nice to get to visit with the family. 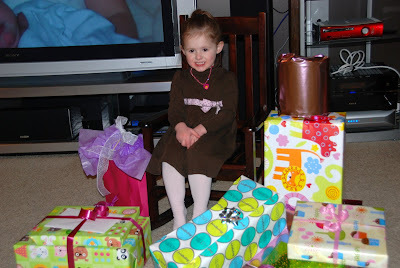 I couldn't resist putting two pictures up of the Birthday Girl and her gifts. She is such a little princess. 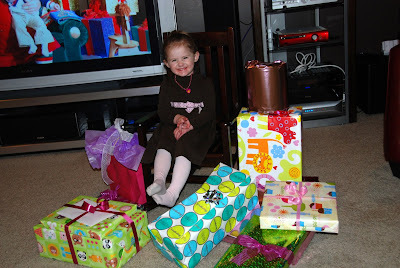 Ivy was so cute opening each and every present. Every gift was followed by a very sweet "thank you" and "can you open it?" She really loved everything she received- the baby dolls, the kitchen set, the dress ups, the puppy dog, the games and the color wonders. 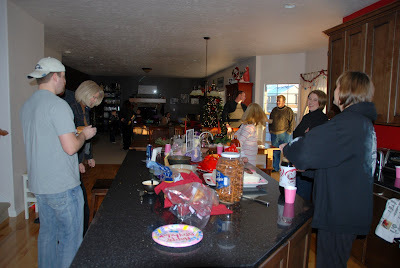 Every one of the gifts is played with over and over again. 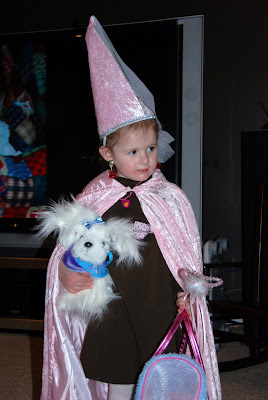 Have you ever seen a cuter princess? 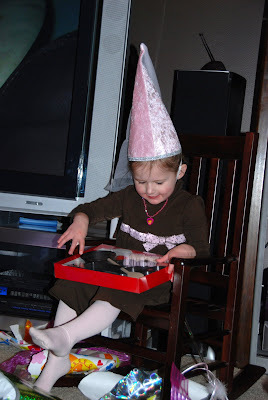 I love the cone princess hat. When I was little, my mom made me a green one and Kat had a yellow one. We were almost as cute as Ivy, but not quite. 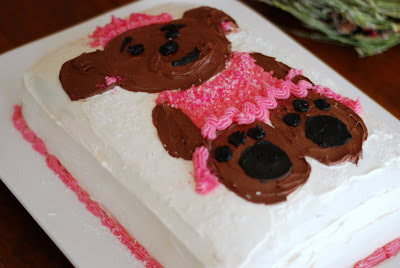 I purchased the fantastic "Build-A-Bear" cake pan from Williams Sonoma, but I had a little incident when I was making it. See, it's a really really good pan. One of those pans that when it says "no-stick" it means it. I was taking the cake out of the oven and it slipped from my hand. It came crashing down and bounced a few times, nicely chopping the cake into little pieces. But, the pan was such a fantastic pan that there wasn't a single crumb left in the pan. 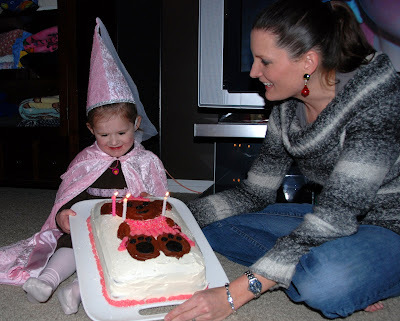 Although the cake pan was great, my spirit was de-flated and she ended up getting a two layer cake with a hand drawn princess bear on it. She loved it! And that is really all that matters. Both girls helped me sprinkle it with glitter and they loved watching me do it. She had a difficult time blowing out the candles, but eventually I was able to help her and I'm sure all of her wishes will come true. Happy Birthday my little three year old! Happy Birthday Ivy! She is as old as our friendship! What did you do for Inauguration Day? The Andrus Family has arrived!!! Merry Christmas and a Spinning New Year!! !